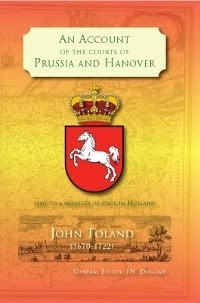 Even after more than 300 years, John Toland's Account of the Courts of Prussia and Hanover remains highly readable and continues to be cited by historians of the period. It gives us an engaging and accessible picture of life in those German courts, and of the people who inhabited them at the turn of the 17th to 18th Century. Toland travelled to Hanover in 1701, with Lord Macclesfield's delegation, to deliver the Act of Succession to the Electress Sophia. The Act named Sophia and her Protestant descendants as heirs to the British throne, should Queen Anne die without leaving a successor. Toland was well received by Sophia, who also introduced him to the court philosopher, Gottfried Wilhelm Leibniz. The following year, he visited the court of Berlin, where he was received by the Electress’s daughter, the Queen in Prussia, Sophia Charlotte. His impressions and observations of those visits are recorded in this Account and faithfully preserved in this new edition, which has previously been available only in facsimile reproductions. Reasons for naturalizing the Jews in Great Britain and Ireland, On the same foot with all other Nations. Containing also A Defence of the Jews against All vulgar Prejudices in all Countries. 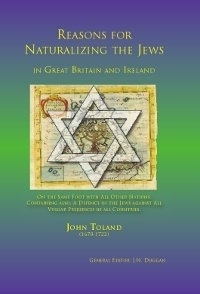 First published in 1714, shortly after the succession of George I to the British throne, Reasons for Naturalizing the Jews in Great Britain and Ireland is widely seen as a landmark work in the movement for emancipation and equal citizenship of the Jewish people. While some would argue that the case being presented by Toland is best understood in the context of British political life of the time, it is generally agreed that it represents a remarkable work: one that, in many ways, is well ahead of its time. "a dog will run at a stone, when he dares not attack the man that threw it." "I am not ignorant how much the world is governed by prejudices, and how farr some, who wou'd not be counted of the vulgar, are yet sway'd by vulgar errors. ... But one rule of life, which is willingly admitted, nay, and eagerly pleaded by all Societies in their own case (tho miserably neglected in that of others) is, not to impute the faults of a few to the whole number." The Foreign and Protestants Naturalization Act of 1709 allowed immigrants to claim British citizenship upon swearing an oath of allegiance to the British throne, and taking the sacrament in a Protestant church. In this pamphlet Toland is calling for the same privileges to be extended to the Jews. This edition of John Toland's pamphlet has been faithfully reproduced from the original, with an introduction, editor's notes and a chronology of Toland, his life and times. Previously available only in facsimile reproductions, the text has been reset using a modern typeface but with original spelling, emphasis and formats preserved. Non fiction, essay, political science. 68 pages. Paperback. 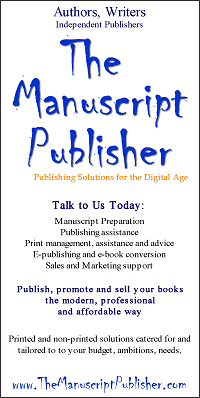 Read Dr. Jordi Morillas' review on Books by J.N. Duggan. See News section. Only the horrors of Nazism could eclipse from our memories the horrors of European and, in particular, British Jewish history. Brought to England by William the Conqueror in 1070, they were tolerated - although, on default of any payment, they were promptly arrested, with their wives, children and servants - until the reign of Richard I, when they were murdered under charges such as "bewitching the King". 500 jews, besieged in a tower of the Royal Palace, their ransom having been refused, and to avoid greater cruelty from their enemies, killed their wives and children and then burnt themselves and the tower. Measures to force Jews to ransom themselves included one eye being pulled out and every day, a tooth. Under the pretence of stealing and crucifying a child - a frequently used pretence - eighteen were hanged. It got steadily worse. 700 were hanged under King Henry III, then, 260, after being drawn at horsetails. Their synagogues were pulled down, 16,511 were banished and their houses sold to enrich the exchequer. After 220 years, Cromwell allowed them back, and under Charles II, all their children under six were detained in 'convert-houses'.